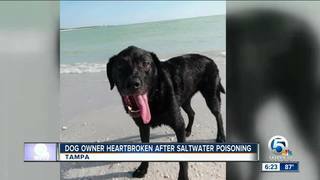 (WFLA/NBC) - A dog owner near Tampa is heartbroken after losing his beloved 7-year-old lab to saltwater poisoning after a day at a local dog beach. They were best buddies for seven years -- side by side and rarely separated. Chris Taylor met his four-legged family member when the little guy was just 3-months=old. The lab, nicknamed, O.G. loved the water. "He's my family. He's just so goofy and just always excited to see me when I came through the door," said Taylor. As Taylor studied at the University of South Florida to become a high school teacher, O.G. was right there waiting patiently for dad to put away the books so they could get to beach, which is what they did on Monday. They played for hours in the water at Honeymoon Island dog beach but that night the lab began to have stomach issues and was lethargic all-day Tuesday. By Wednesday, the pup wasn't eating or responsive. Chris rushed him to the vet, but it was too late. "I saw him last night and he was convulsing, and I asked if he was in any pain, she said I just don't think he's even aware of where he is," said Taylor. Experts say when dogs ingest large amounts of saltwater it can cause severe brain damage, dehydration and seizures. "Things can come on gradually and you're not always aware of how serious things are right up front," said veterinarian Katy Meyer. Meyer said when sodium levels get really high, they affect the brain and your pet's life is in danger. "When the brain gets affected, the whole body gets affected," said Meyer. Meyer said if you want to take your dog to the beach, limit the trip to two hours, taking breaks every 30 minutes with plenty of fresh water for your four-legged family member.